Here's yet another price reduction as Neal Esterly at Fraser Yachts sends news of a $300,000 cut in the price of the 32m Sunseeker 105, the only one of her size available in North America. 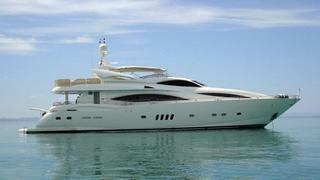 Delivered in 2002, she has accommodation for 10 guests in an on-deck master, VIP and two twin staterooms. This superyacht has a luxurious interior with cherrywood panelling and cabinetry combined with contemporary decor. Just prior to coming on the market in November 2010, she had a major refit to ensure she’s in turnkey condition for a new owner, Currently lying in Mexico, the Sunseeker 105 is now asking $3.695 million.